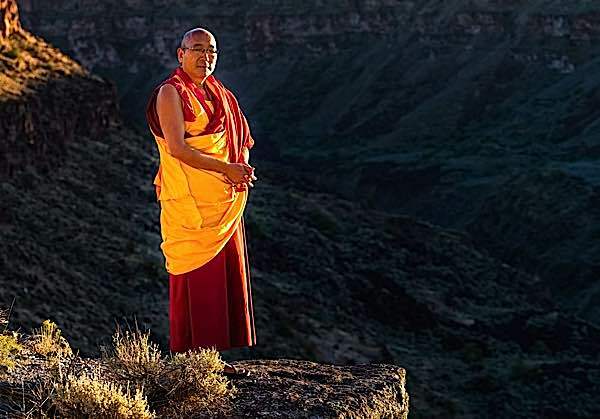 Lama Sherab “was born in 1967 in a very small village in the western part of Nepal.” As a young boy, he became a monk at Kopan Monestary — years away from family, and a rigorous study day from 5:30am to 9:30pm. “When I was a teenager, as any normal teenager, I struggled a lot, not knowing whether it was best for me to continue or to disrobe. But then, just before I went to Sera, I made the strong decision that being a monk continuously was how I was going to spend my life.” He went on to even more intense studied at Sera Je. The young monks at Sera Je. You taught on Lama Tsongkhapa meditation practice. Why are Lama Tsongkhapa practices so valued by modern Buddhists? Geshe Sherab: Lama TzongKhapa is known sometimes as the second Buddha and second Nagarjuna. No other Tibetan master or holy being has contributed to dharma as much he did through his writing, example, inspiration and practices. Also Lama TzongKhapa is known as manifestation of Manjushri, Avalokiteshvara, and Varjapani. So practicing Lama TzongKhapa Guru Yoga is equivalent to practicing the sadhana or practice of all those three deities. You also taught the “Stages of the Path to Enlightenment”. What are some of the key stages and methods you covered? Geshe Sherab: I cover precious human rebirth, death and impermanence, renunciation, bodhichitta and emptiness. You were accepted as a monk by Lama Yeshe at Kopan Monestary at a very young age. What is life like for the young monk in a monastery? The life for young monk like any young boy in boarding school. Of course many monks could not see their parents for few years as they live too far away. It is not easy for both parents and the young monk but that is part of training. Lots of discipline and studies but not much time to relax and enjoy. So, it is tough and many will drop the robe. Starts the day at 5.30am to go to bed at around 9-10pm. 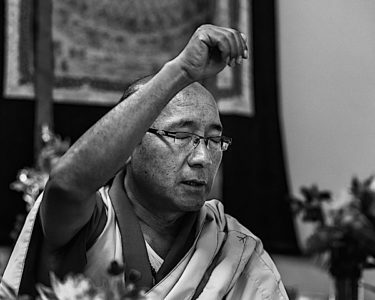 His Holiness the Dalai Lama is one of Geshe Sherab’s teachers. 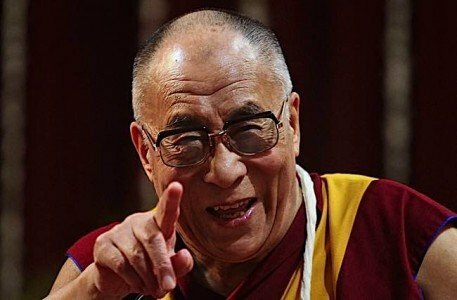 H.H.Dalai Lama, H.E. Jangtse Choje Rinpoche, late H.E. Khensur Losang Tsering,H.E. Khensur Losang Delek, Kyabje Lama Zopa Rinpoche are the main teachers. My other teachers included H.H.Sakya Trizin Rinpoche, late Chodon Rinpoche, late Dema Locho Rinpoche, late Dulgo Khentse Rinpoche, late Paglung Rinpoche, late Ugen Tseten Rinpoche,late Khensur Lama Lhundup, late Geshe Losang Jampa, late Geshe Jampa Gyatso, Geshe Doga. 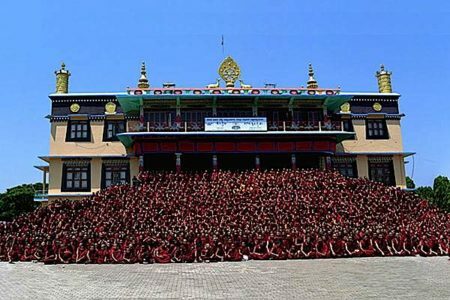 You studied at Sera Je Monastery for the Geshe degree starting in 1987. Why did you decide to work towards the Geshe degree? Geshe Sherab: I went to Sera to study further but not necessarily to become a Geshe. But once I was close to finishing my study I thought of taking Geshe exams. What was a typical day or week like at Sera Je for a student working towards a Geshe degree? 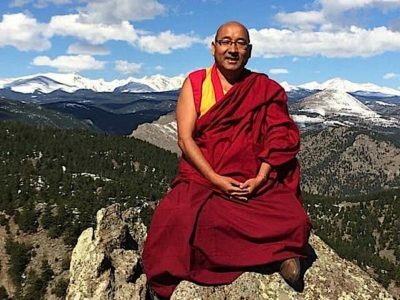 Geshe Sherab: 5.30-7 am puja, 7-9 am memorization, 9-11.30 am debate class, 11.45 am lunch, 12.30-5 pm rest time, receiving teachings from teachers, and self studies, 5 pm dinner, 6-9.30 pm evening debate class, 9.30- 10 or 11 pm to recite and repeat what has been memorized. Every Tuesday is off day. How does teaching to Western students differ from how you might teach both monastics and lay people in Nepal? 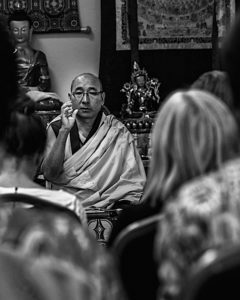 Geshe Sherab: Yes, since it is different culture and psychology, the method has to be little different. In essence it is same but we have to present slightly differently. For Westerners, especially, is it more difficult to teach integration of study and practice, or integration of Dharma with daily life? How do you approach this? It is different for different students. Some students are more interested in studies and philosophy but not much interested in practice. Some other are more interested in practice, but not much studies. So I encourage all students to integrate both studies and practice together. We cannot ignore either of them. Practice means both meditation on cushion as well integrating the Dharma with our every day or daily life. Geshe Sherab: “Within Sera Je Monastery there are two divisions for study. 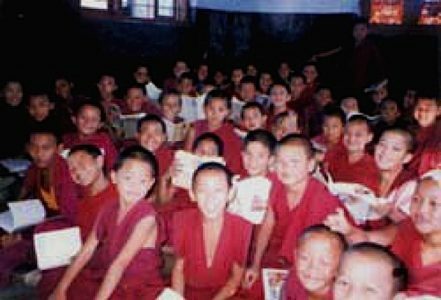 For young monks of age of 7 to 18, they attend the Sera Je School which provides general modern education with subjects such as English, Mathematics, Science and Arts in addition to Tibetan Grammar, Buddhist Philosophy etc. At the moment there are around five to six hundred students in the school from grade 1-12. 5.00 am Wake up and wash.
5.30 am Morning prayers. Breakfast will be served during prayer session if there is any sponsor. 7.30 to 9.00 am Memorizing prayers and scriptures. 9.00 to 10.00 am Debating class. 10.00 to 10.30 am Chanting Sutras and reciting prayers as preliminary practices as well as to eliminate obstacles toward one’s study and practices. 10.30 to 11.30 am Debating class. 11.30 to 12.30 pm Lunch with prayers and dedications for sponsors and all sentient beings. 12.30 to 1.00 pm Break time. 1.00 to 2.00 pm Receiving teachings from teachers. 2.00 to 4.00 pm Homework. Reading, reflecting and discussing on the subjects, covered particularly by the teacher on that day. 4.00 to 5.00 pm Receiving teaching from teachers. 5.00 to 5.30 pm Dinner with prayers. 5.30 to 6.00 pm Break time. 6.00 to 7.00 pm Evening debating class. 7.00 to 8.30/9.00 pm Prayers and meditation. Reciting Heart Sutra, 21 Tara praises many times and reciting many other prayers as preliminary practices and to eliminate obstacles toward one’s study and practices. 9.00 to 10/11.00 pm Debating class (Some of the monks will continue until midnight or 1 am). 10/11.00 to 12.00 mn Reciting the prayers and scriptures which have been memorized so that one does not forget.